Running in New York is a popular pastime. Running through Central Park, along the Hudson River or over the Brooklyn Bridge, will make you feel like a real New Yorker. I regularly sprint too. To my front door when my pizza is delivered. But for those who really love a workout, I’ve made a selection of the best places for running in Manhattan. Did you know that there are actually several loops that pass by the major attractions of the city? This is a perfect activity if the New York Marathon is a bit extreme for you, but you still want to go for a run in the city. 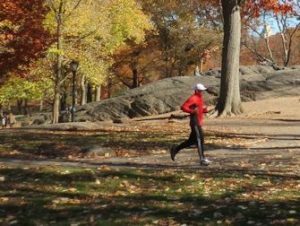 The most popular spot for running in New York is, of course, Central Park. Local New Yorkers head to the park regularly to work on their condition. There’s a paved route through the entire park that includes several lanes: for cyclists, pedestrians and motorised vehicles. This is a good track for a safe run. A full loop through Central Park is nearly 8 kilometres. But, you can also take one of the various transverses to cut across the park. Would you like to know more about the sights you pass by while running? Then join this casual run through Central Park. During this 5k running tour, the guide will explain all about the famous hotspots as you jog by. Do you have the energy to go for a longer run? Then this 6.5k Central Park Running Tour might be for you. Eric’s Tip: If you’re planning on going for a run in Central Park, head to the park early in the morning. Later in the day, it can be quite crowded. I wouldn’t recommend going in the evening as the park isn’t a very safe place at night. Don’t forget to bring your MetroCard in case you’ve been running behind a good looking New Yorker for too long and you’re too exhausted to run back. Another hotspot to check out for a run is the Brooklyn Bridge. Take the subway to Brooklyn and run back towards Manhattan. If you’ve been eating too many hotdogs, you can also run to Brooklyn first and then run back. Don’t forget to stop every once in a while to enjoy the skyline views. On a Friday, you can also join The Brooklyn Bridge Running Tour. During this guided tour, you’ll cross the Brooklyn and Manhattan Bridges and pass through Chinatown. The tour ends at City Hall. Manhattan offers many more places for a good run. They’re perhaps less known, but might be just as fun. You can even jog through the busy area surrounding Times Square. During The Running Tour over The Crossroads of the World, you’ll discover Times Square, Grand Central Station and Rockefeller Center. If you want to know more about the melting-pot, you can join The Immigrant Running Tour. The guide will take you through SoHo, Little Italy, Chinatown and the small streets of Lower East Side. At the end of the run, you’ll be rewarded with a cup of coffee at a local coffee place. In Lower Manhattan you can also discover the roots of New York. This is the area where immigrants entered the country and left their marks at South Street Seaport and City Hall. Join The America’s Roots Running Tour to discover these places. You’ll also pass by Ground Zero and 9/11 Memorial. The High Line Park in New York is definitely worth visiting. It’s an ideal place for a run in the morning. If you take The Village Running Tour, this park is just one of the numerous beautiful spots in New York you’ll discover. You’ll run through the quiet streets of the West Village, along theatres and restaurants. If you’re lucky, you might even spot a celebrity during this tour.